In my old fashioned mind not much of anything is quite as intimidating as a blunderbuss. It is the deck sweeper of Admiral Horatio Nelson’s day just as the Thompson sub-machine gun became the “trench sweeper” of the Great War. Though Smith and Wesson may have brought out their “Governor” and Taurus their “Judge” sadly their 45 caliber bores do not compete with the cavernous opening of a blunderbuss nor the sheer scale of the unpleasantness one would be expected to unleash. In short, every home should have one. Bonhams will be auctioning two flintlock blunderbusses in their Antique Arms & Armour and Modern Sporting Guns auction on 11th November. The one in our feature image is a circa 1770-1780 vintage canon with a 14 1/2″ two stage brass canon barrel and built in 13″ spring bayonet. Just think, not only a blunderbuss, but a blunderbuss with a built in man size “flick knife” – or should that be “flick bayonet”. Eat your heart out Crocodile Dundee. The second blunderbuss in the auction is a silver mounted Ottoman flintlock blunderbuss. This one has a 10 3/4″ barrel with panels of leafy florals overlaid in silver. Being a Turkish, Ottoman Empire blunderbuss we can imagine this sort of thing being wielded by a guard of a sultan’s harem to persuade any lads intent on laddish pursuits of the undesirable results such undertakings might result in. So, where other people might have “Coffee Table” books as their living room conversation pieces I think having a few “fun” antiques is preferable. 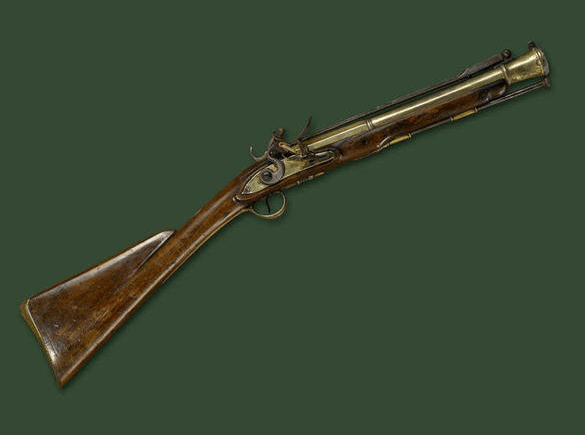 Thus an antique flintlock blunderbuss and perhaps a matching naval cutlass fit with my notions of “fun” antiques; useful as conversation pieces and also useful if you are the father to a pretty daughter when she brings home her first boy friend to meet the family.